Pre-made adventures are great for a GM that finds themselves without a lot of time to make up something from scratch for their game. For the GM that's really busy, they could check out The Forgotten Dungeon. It's an adventure that's over 100 pages and filled with all manner of things to keep players on their toes for several levels to come. The book is up on Kickstarter now. 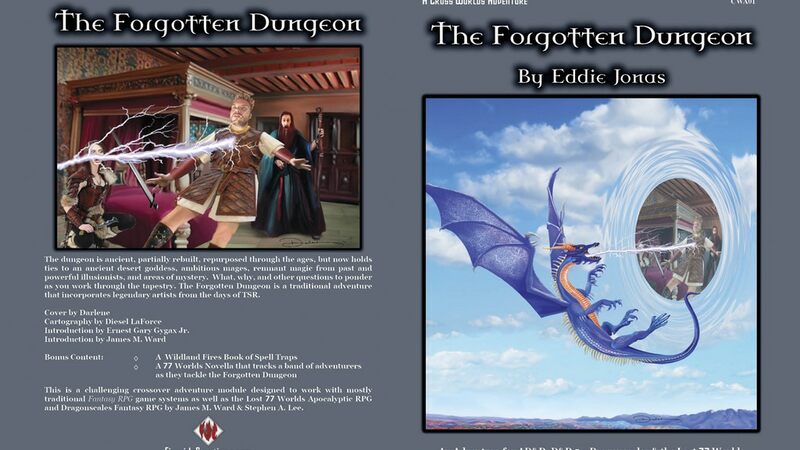 The Forgotten Dungeon is an old school adventure that incorporates legendary artists from the days of TSR. Darlene created the original Greyhawk maps for Advanced Dungeons & Dragons, plus other valuable early gaming works. This fantastic legend is the artist responsible for the masterful cover art for The Forgotten Dungeon. Diesel, the artist most remembered for his early Dungeons & Dragons dungeon art at TSR, has formed the new dungeon art for this adventure. It is the only recent dungeon by his hand. These artists have blessed this, The Forgotten Dungeon, with their reunion and their art, fits well, providing the feeling of the first edition. The versatility of The Forgotten Dungeon is owed in part to the included additional WCS statistics for use with WCS based games like 77 Worlds RPG and Dragonscales RPG by James M Ward and Stephen A Lee, allowing the adventure to work in both Fantasy and Sci-Fi games. 77 Worlds is a post-apocalyptic gaming system while Dragonscales is a new take on Fantasy RPGs. This Mega Adventure includes a booklet of spell traps which can be incorporated into your own campaign adventures. Further, the included novella gives a 77W look at a band of adventurers as they navigate this very dungeon. The added value is another nod to old school works. The campaign is already up and over its funding goal with 39 days left to go.